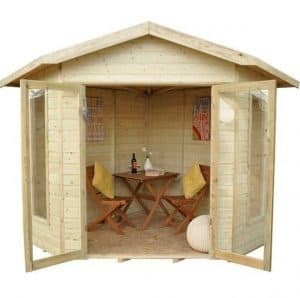 The Hartwood 8′ x 8′ FSC Pressure Treated Bancroft Corner Summer House is a very cool, smart and actually rather classy type of summerhouse that offers you a considerable amount of floor space in a very fun shape. 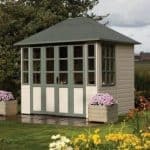 The shape of this summerhouse makes it ideal for corners and it does give it a bit of a different style from a traditionally shaped summerhouse. It has a charming design and will be well illuminated thanks to the large windows on the sides and the two huge windows on the doors. The doors are six feet wide so getting something as large as a sofa in here will be no trouble at all. 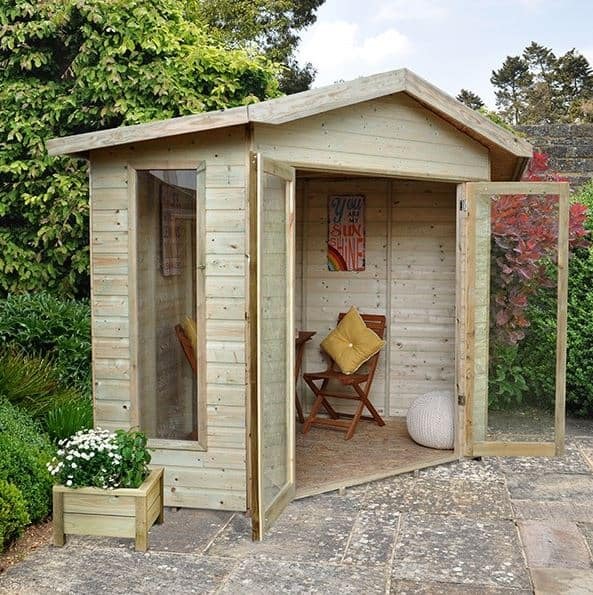 This is a summerhouse that will see you spend many hours, relaxing and enjoying watching the world go by. At 12 mm thick and pressure treated the tongue and groove shiplap cladding that is used here is just fantastic. It manages to be strong, watertight and also very easy on the eyes. This is attached to a very thick frame that will make it so the summerhouse stays strong for many years. The roof is done in a very interesting way as it is an apex roof, but as it slopes towards the back you also get the benefits that you would if it were an apex roof on here. 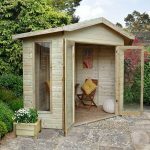 Today we are looking at a summerhouse that would be ideal for those of you who have that little extra space in the corner of the garden or even those who just want to have a really great summerhouse, but have it kind of out of the way and not right, bang in the middle of the garden. The Hartwood 8′ x 8′ FSC Pressure Treated Bancroft Corner Summer House is one very nice looking structure that really no matter where you place it, is going to really stand out in your garden. While called an 8 x 8 summerhouse, due to the corner nature of the summerhouse the actual structure takes up more room than you would think so keep that in mind. The overall width is 11 feet 5 inches and the depth is 8 feet 4 inches, so while the shape may be a bit unorthodox it does give you plenty of space to play around with. The height of the summerhouse is fantastic as the eaves height is just over 6 feet and the ridge height is 8 feet 1 inch. This height means that you party animals will have plenty of room to pump your fists in the air, or if you are not into wild parties just think of this extra headroom as making it much more comfortable to spend time in here. An apex roof is not something that we would really expect to see on a corner summerhouse, but there it is. Sitting on top of here looking all happy with itself. And really why should it not be? It is a very well made roof that is made with tongue and groove boards to give it some style as well as strength and then it is covered with some heavy duty sand felt. We really like the way that it slopes down towards the back so in many ways you are getting the benefit of having both an apex and a pent roof. The cladding really does look awesome. They have used pressure treated timber which has this very nice light look to it. At 12 mm thick the tongue and groove shiplap cladding is not just trying to impress you with its good looks. This thickness makes it strong and very long lasting which is something we and without a doubt, you will really like. 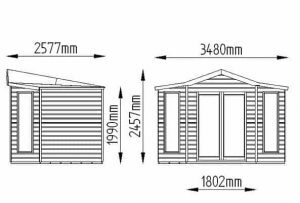 45 mm x 27 mm is not a frame size that we see all that often, but we are happy when we do as it makes for one very strong summerhouse. This is a well crafted frame that is joined to the summerhouse very well. You can see in the pictures that while thick, the frame does not stick out all that far so it is not going to take up much space. The floor is made from sheet material which we must admit while strong, from a looks point of view is a little bit disappointing as let’s face it, it does stand out from the lovely tongue and groove boarding that is used for the roof and the cladding. Still, we are sure some people will not care or notice, and those that do can always shake things up with a smart looking rug. The pressure treated timber is very low maintenance so you do not have to worry or even remember to treat this on a yearly basis. Wood treatment could always be applied if you did want to give yourself that little extra protection, but truth be told it is not necessary. 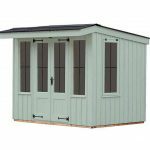 The Hartwood 8′ x 8′ FSC Pressure Treated Bancroft Corner Summer House does come with a very generous 15 year guarantee that will cover the summerhouse in the rare occurrence that it does have some kind of issue with rot, but with the timber being pressure treated this is very unlikely. At 6 feet wide these are some of the widest double doors that we have seen, and add into this they just under 6 feet high and you have one very impressive set of double doors. The size of the doors will make getting your larger, bulkier and heavier items in easier. The doors are mainly made from 1.2 mm thick styrene with a solid frame around it. Two hinges are what will keep the doors in place and they are strong enough that you will not have any problem with sagging. While the doors are pretty much two large windows, you do actually have another two windows on this summerhouse. These are smaller and thinner and located on the sides and we really like the way they look. The same kind of styrene has been used for these windows and with it being shatterproof for those of you with children, you will have no concerns about them breaking the windows and broken glass being everywhere. While we really like the doors, we do wish they had put a better locking mechanism or even any kind of locking mechanism on here as all there is, is a simple turn button. This does mean that you will have to purchase a hasp and staple, padlock or a pad bolt if you want to make sure your belongings in here are safely locked up. This is not offering a lot in the way of privacy, but that to be fair is by design so we will not be too harsh on the summerhouse for that. We like how open the windows on the door make this and if you do want to make it more private then some blinds or even curtains would work very well. 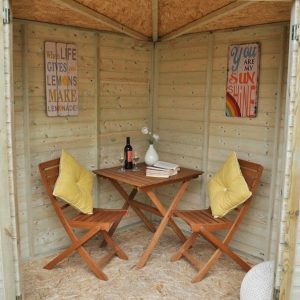 While we are big fans of the way that the pressure treated timber looks in its natural state, you could always paint the summerhouse in a more vibrant colour if you want to brighten things up a little bit. Of course you could always go the other way and give it a coating of classing dark brown paint. A plastic shed base is available as an extra for a cost of £161.99. 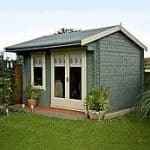 If you are installing the summerhouse on a concrete surface or even a solid decking area then you will not need to consider this. 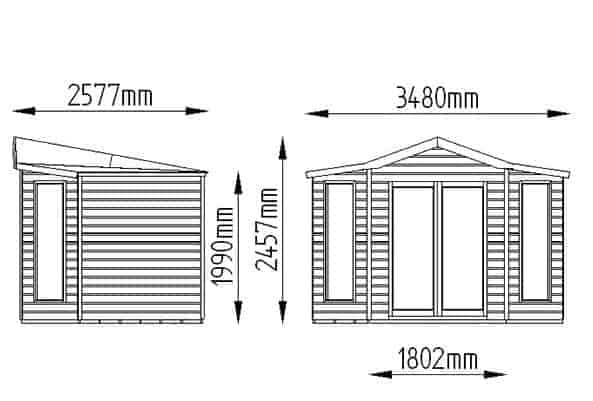 Those who will be placing the summerhouse on grass may want to consider this if they do have a couple of worries about the ground the summerhouse will be living on. 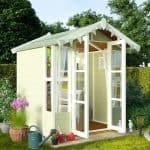 This is one very high quality summerhouse and while we were a little critical of the floor, we must say the reason for this is because the rest of the summerhouse is so high quality it really stood out. As they have used pressure treated timber and the design is so good, this is going to be structurally sound and watertight for well over 20 years. Best of all, it requires very little maintenance from you. You will have to think about how you organise your furniture in here as the space can be tight, but even though this is not one of the larger summerhouse, you still can make the space it offers go pretty far. The high roof is the only thing that will be a little on the fiddly side for you and the person you talked into helping. Apart from this even if you are not a skilled DIY person with your own DIY show on YouTube, you still will find this a pretty straightforward experience. We do really like this summerhouse, but it is a little on the high price side. There is nothing wrong with the materials used here and that is the reason it is the price it is, but we have seen similar priced summerhouses for considerably less. Final Thoughts: The Hartwood 8' x 8' FSC Pressure Treated Bancroft Corner Summer House is a very eye catching summerhouse. 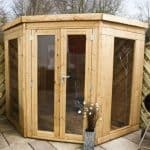 There is no doubt about it, this is one very attractive looking summerhouse that really does have a lot of personality. It is made with strong materials and the timber has been pressure treated. 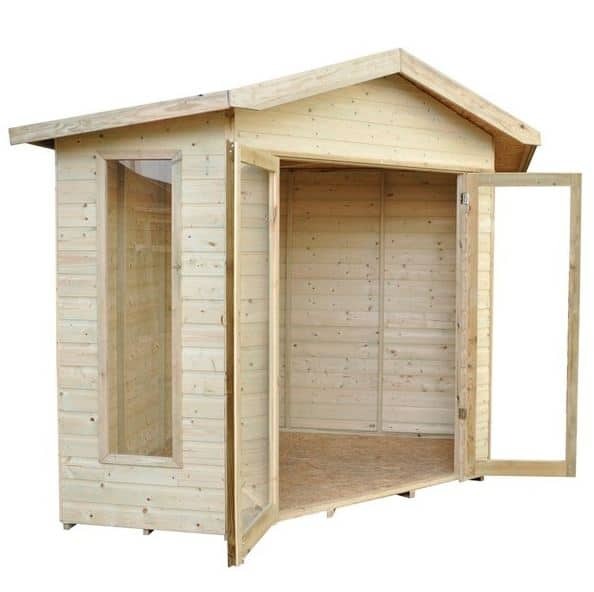 In short this has everything you would want in a more compact sized summerhouse. We know that this is priced rather high, but if you do love the look of this and have fallen in love at first sight with this, then we can tell you that it is so well made that you can expect to enjoy this for many years and we are sure you will feel the extra money was well worth it.